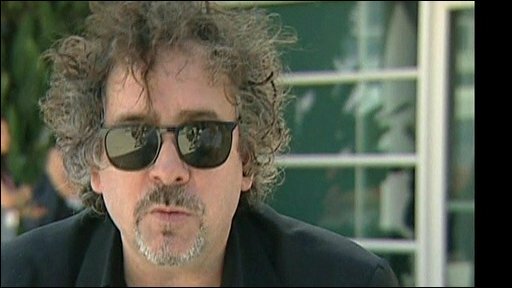 Tim Burton's new film version of Alice in Wonderland will not be screened at Odeon cinemas in the UK, Irish Republic and Italy, the cinema chain says. The move is in response to the Disney studio's plan to reduce the period in which it can be shown only in cinemas from the standard 17 weeks. The plan would allow Disney to release the film on DVD at the end of May. Cinema chain Vue said today that it had entered a "far reaching" agreement to screen the film on its 69 screens. And Cineworld cinemas announced last week that they will also show the movie on its release on 5 March. But Odeon said it would "set a new benchmark, leading to a 12-week window becoming rapidly standard". Odeon's decision will not affect the film's Royal premiere on Thursday, which is coincidentally set to take place at the Odeon Leicester Square in central London. Nor will it affect its plans to show the film in Spain, Germany, Portugal and Austria - territories where Disney intends to observe the normal DVD release window. 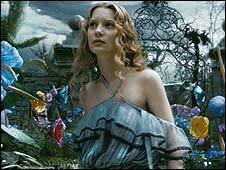 Starring Johnny Depp as the Mad Hatter, Alice in Wonderland sees the novel's heroine return as a teenager to the magical kingdom for more surreal adventures. Inspired by the works of Lewis Carroll, the film also stars Helena Bonham Carter, Anne Hathaway and Little Britain's Matt Lucas. The Odeon & UCI Cinema Group is Britain's largest cinema chain with more than 100 sites nationwide. Cineworld and Vue are the second and third biggest. Together they represent just under two-thirds of all cinema screens in the UK. It is the amount of time that separates a film coming out in cinemas and its release on DVD that is at the centre in this dispute. In the UK, the window for theatrical release is 17 weeks. 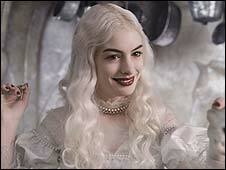 In the case of Alice in Wonderland, Disney wants to reduce that to 12. Disney told the BBC that one of the main reasons for the decision was to bring the film to customers more quickly, thereby helping to beat piracy. It said if a cinema stopped showing a film before the 17-week exclusivity period, the audience did not have a legitimate way to see the movie - potentially leading to piracy. It said it had agreed to take this approach with a limited number of movies every year in certain countries. Bob Chapek, Disney's president of distribution, has said the company remains "committed" to theatrical windows. However, he believes there is a "need for exceptions to accommodate a shortened time-frame on a case-by-case basis". Odeon, though, believes such a move will damage not just its business but that of all cinemas in the UK. "The negative impact on cinema attendance that such a reduction in the window will have will threaten the continued existence of many cinemas, especially the smaller and medium-sized cinemas." Odeon also highlights the additional costs the chain has incurred making its screens suitable for 3D movies. "Odeon/UCI has invested considerable sums of money, especially in the UK, over the past 12 months to install digital projection systems in its cinemas," it said. "The proposed reduction in the window on a high-profile 3D title like Alice in Wonderland undermines the investment made." Disney also faces opposition in Belgium, the Netherlands and the US over its plans for this title. It is not the first time, however, it has attempted to make overtures in this area. Last year, the company attempted to reduce the theatrical window of Up, the hit Pixar movie named best animated feature at the Baftas on Sunday. In that instance it dropped its plans after UK exhibitors threatened not to screen another of its titles, A Christmas Carol, later in the year. Neither is Disney the only studio to have faced opposition over theatrical exclusivity from UK cinema chains. In 2007, Odeon and Vue removed Ben Stiller comedy Night at the Museum from their cinemas after 20th Century Fox shortened its theatrical window to 13 weeks. The Cinema Exhibitors' Association, the body representing the interests of around 90% of UK cinema operators, has not commented on this latest case. Speaking "in general terms", though, it said it "strongly" supported the maintenance of "a clear and exclusive window between a film's theatrical release and its release on other platforms". "The CEA believes maintenance of the window will ensure that audiences continue to enjoy the widest possible range of films in their intended environment, the cinema theatre."